Our campers like to have endless hot water available to them. We built a heat exchanger that we can place in our campfire to heat an endless amount of water. Using a simple cooler we have a lightweight and insulated water tank for storage of our hot water. It's not uncommon for us to have hot water left over in the morning even when the temperatures outside are freezing. This hot water heater doesn't require propane or electricity. You don't need to have a hose running from a tap or municipal water either. You do however need a source of clean fresh water. Our endless hot water system works so well that if the probe is left in the fire long enough, we can literally boil water in our cooler which can be 10 feet or more away from the fire. 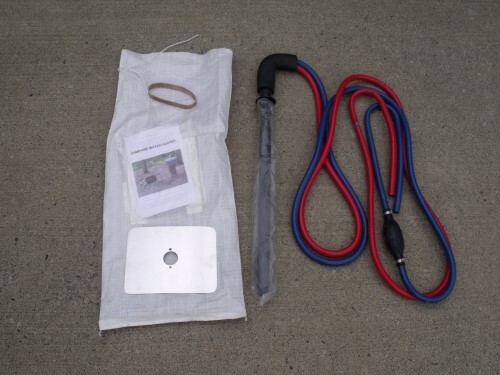 This is a great system for heating water at a remote campsite especially if you don't want to spend money for things like electricity, gas or propane or fuel for a generator. This system of heating hot water could also be used in the event of a natural disaster or for emergency use. Everyone who sees this water heater at our campsites comments on how cool a device it is. First you place the hose with the primer bulb into the cooler and then using the primer pump water all the way through until the water comes out the end of the other hose. 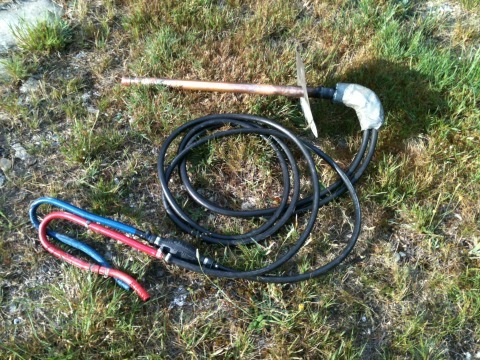 Then place the other hose into your cooler. Then the long probe goes into the fire, be sure to use the heat shield to protect the handle. Sit back and wait for the fire to heat your water. One Important Note: The cooler should be elevated about 2 1/2 feet above the fire source. How we handle the hot water situation goes something like this. Once the water in the cooler has become heated we take remove the probe from the fire. After the water cools we just reinsert it to heat it again. For washing dishes or having a bath we just ladle out the required hot water and add enough cold water to bring it to the required temperature. How Does the Hot Water System Work? It is a basic siphon system with a primer bulb in the line that also acts as a directional valve (check valve) making sure the endless hot water only flows in one direction. We start with the hose that has the primer bulb in the water and prime the hose until water comes out the end of the other hose. Then we insert both ends into the tank before we place the probe into the campfire. In a couple of hours time you'll have 50 liters of hot water at your disposal. The water is heated inside the probe and similar to a coffee percolator the hot water rises and flows along the hose and goes into the tank. Each surge of hot water draws water out of the tank. It is a continuous loop and eventually the water in the tank is heated. How long you leave the probe in the fire as well as the fire temperature will determine how hot the water will get. The system does have one drawback; although there isn't really any danger for explosions (it's an open system) so no pressure can develop, the water tank (cooler) in our case holds about 50 liters of VERY HOT WATER! You must be sure that everyone knows of the risks involved of have a container of hot water like this around. If it spilled on someone A VERY SERIOUS BURN COULD RESULT! It is the users responsibility to take precautions against hot water burns! For International shipping, please use the contact us form and ask for a quote. Be sure to include your email and physical mailing address. Here is a video of a new hot water heater being unpackaged and set up. For those who have requested a materials list for making this hot water heater system, we have created plans for the home builder or DIY person to build. Plans are now available for building your own endless camping hot water heater. It's a simple project built from readily available materials. In order for the siphon effect to work correctly the tank should be elevated about 2 1/2 feet above your fire. A sturdy table will work fine for this. Make sure your cold water reservoir doesn't run dry or you could ruin the hoses and pipes. You can also use the water heater to pump hot water up to a storage tank that may be 10 feet above the fire. Once you use some of the hot water, you simply top up the tank and wait for the fire to bring your water up to temperature. This is one of the best camping essentials I have ever made. I would never consider camping without one again. I can honestly say that countless other campers that have seen this system have been very enthusiastic about having an endless hot water system for their campsites too. 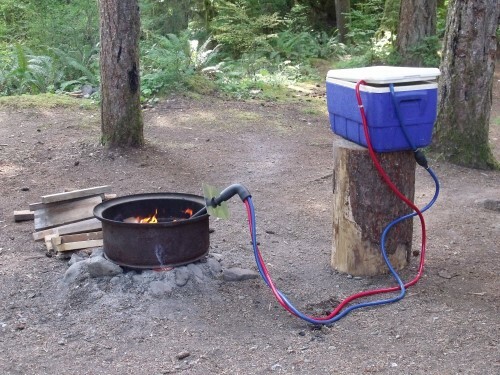 Karen says: "Unlimited hot water when out in the woods camping? Yes! We've camped for years with our friends that have one. This is probably the most innovative device I've seen. So simple to use. Just need a campfire fire and you can have continuous hot water for a multitude of uses." 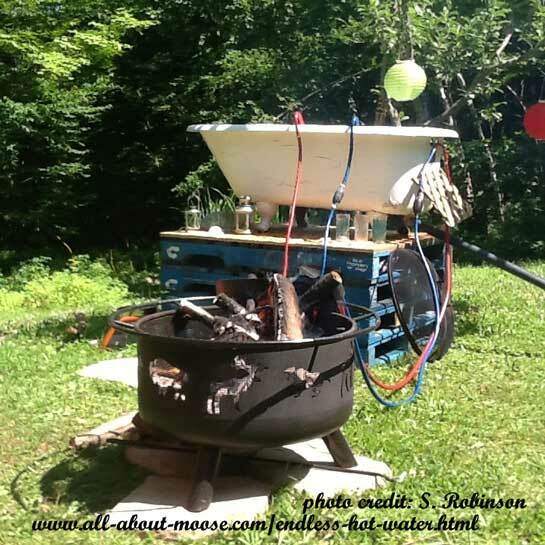 Bill sent this in: The camp fire water heater is a great creation. It is simple, efficient, effective camping "appliance". 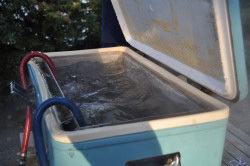 Just add water to an old slightly modified cooler, place the incoming and outgoing hoses into the water and prime then place the heater rod into the camp fire. That's it! In a short time you have plenty of very hot water to use for dishes, washing up, etc. Just add water when you need more. Incredible!